This is a cowboy candle. More about that in a bit. 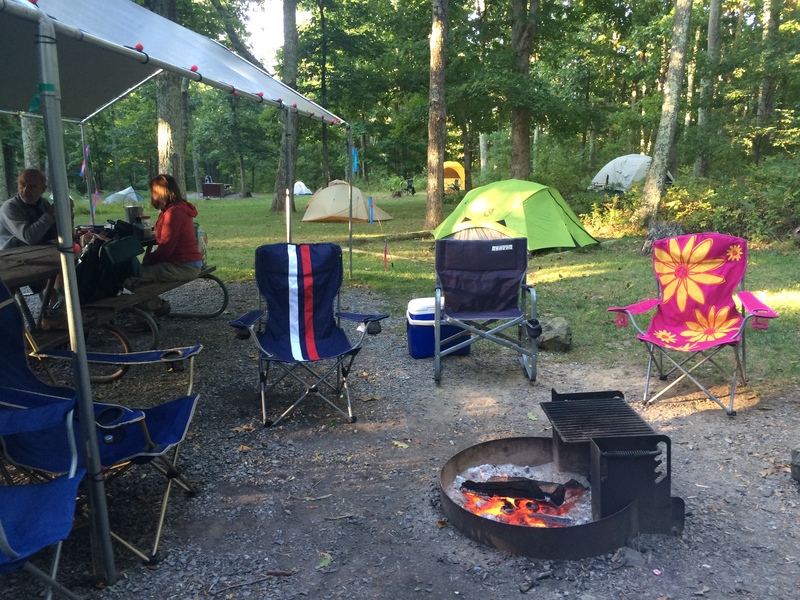 Shenandoah National Park, Mathews Arm Campground, September 18 – 20, 2015 — Come September mother nature begins nodding off as she contemplates her year’s achievements and a well-deserved winter rest. Her spring creations are mature now having flourished in the embrace of warm summer sun and slaked by rain. It’s time to lengthen the nights, turn down the heat and prepare to swaddle in blankets of white. With the humidity having been wrung out of the autumn air, my car pulled in just after 8:30 p.m. Friday evening. 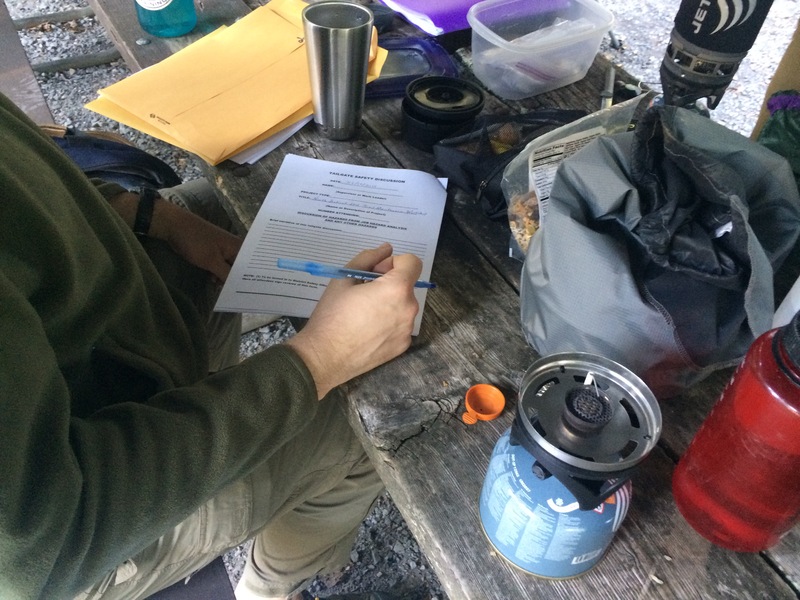 I’d been helping with a thru-hiker event at an REI store in Virginia that nailed my feet to the floor until after six — dead into the locked jaws of outbound D.C. area traffic. The penalty of “rush hour” tacked a vexing extra hour to my trip, thank you very much! Traffic is the only thing in Washington that isn’t in a hurry. As I shut off my ignition, it was dead dark and I was much later than I wanted to be. I still had to find a spot, pitch my tent, cook the a la foil steak resting in my cooler, and get some rest before the starting gun popped Saturday morning. 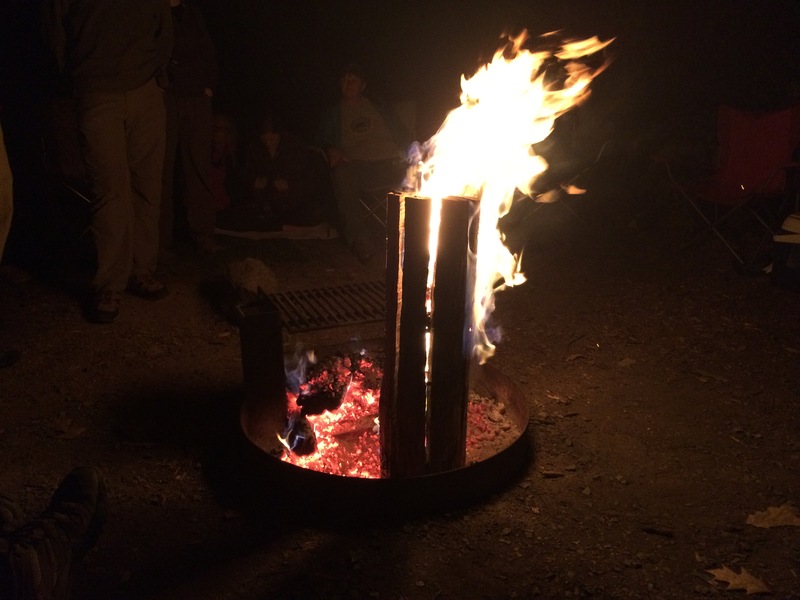 The night was warm with a gentle breeze that allowed me to snooze on top of my sleeping bag. 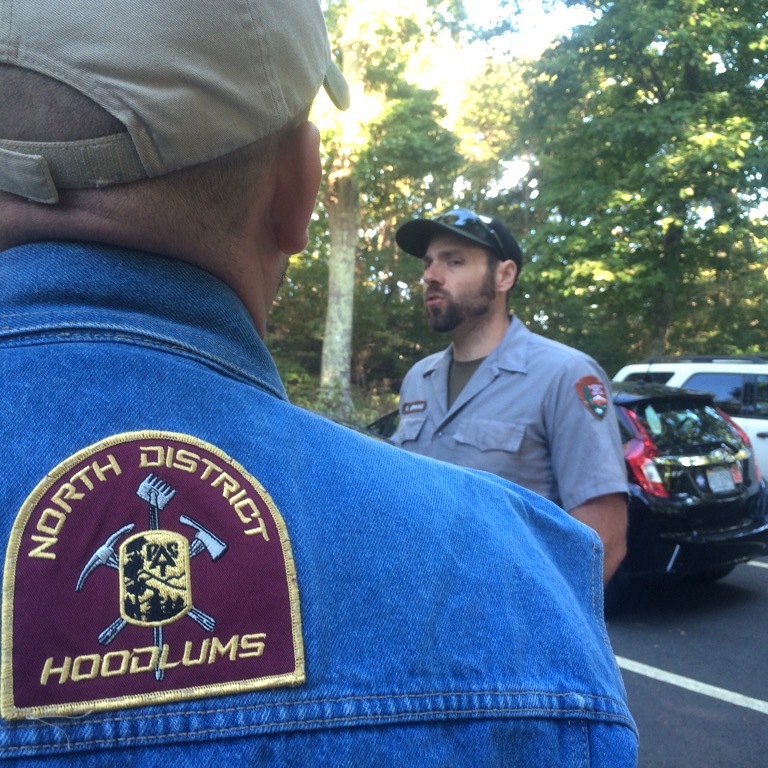 The workshop is a cooperative effort between the Hoodlums trail crew and the Shenandoah park rangers. Our workshop is an excellent training exercise limited to 30 participants. They are divided into three groups classified as novice, intermediate and advanced trail maintainers. People come from other geographical areas and maintaining clubs to take part. 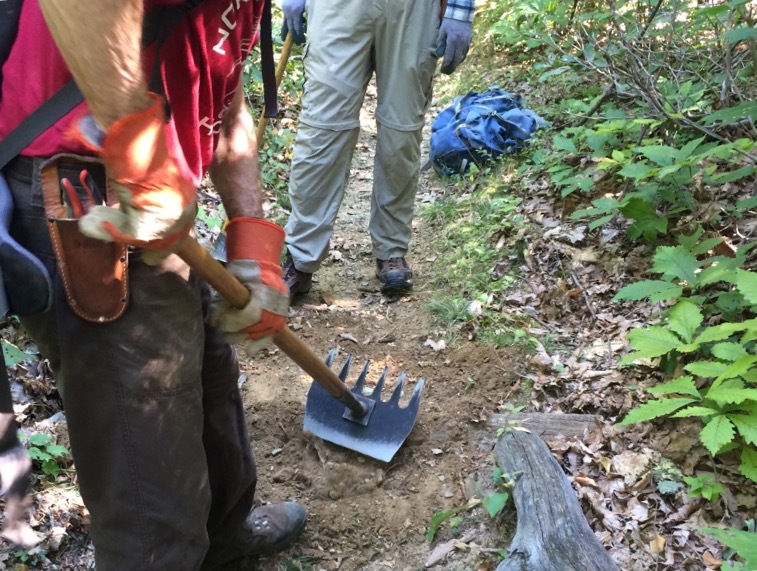 I led an intermediate level group of five to build and rehab check dams and water bars on my section of the Appalachian Trail. So much for the work. The best part is socializing at the bookends of the day. We each contribute to a kitty so that we can hire caterers from Pennsylvania who have been with us for years. All we have to do is schmooze and have fun. 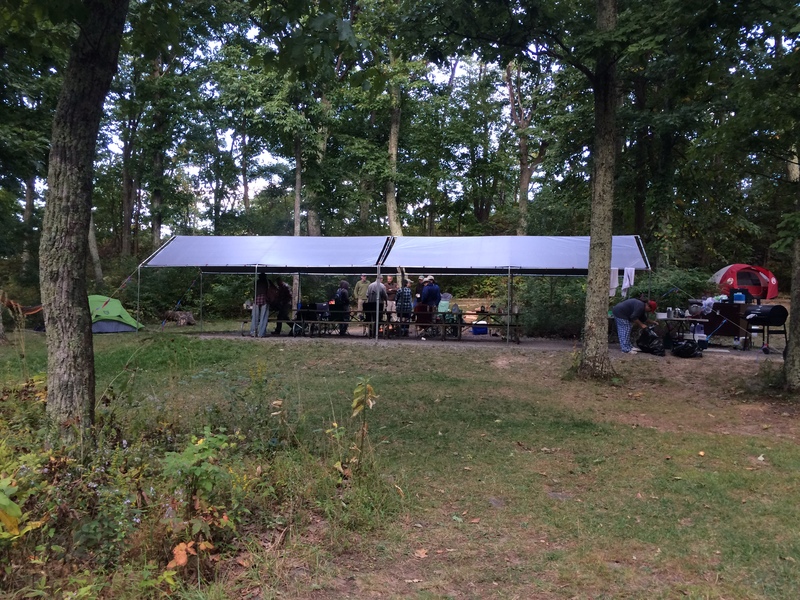 The Park Service sets up an awning for us. Thanks to good weather we didn’t need it. I could get used to car camping. Unlike backpacking, if you think you might need it, you just pitch what ever ‘it” may be into the trunk of your car. That’s why everyone brought a cooler full of beer! Saturday night is the only “official” night of the workshop. 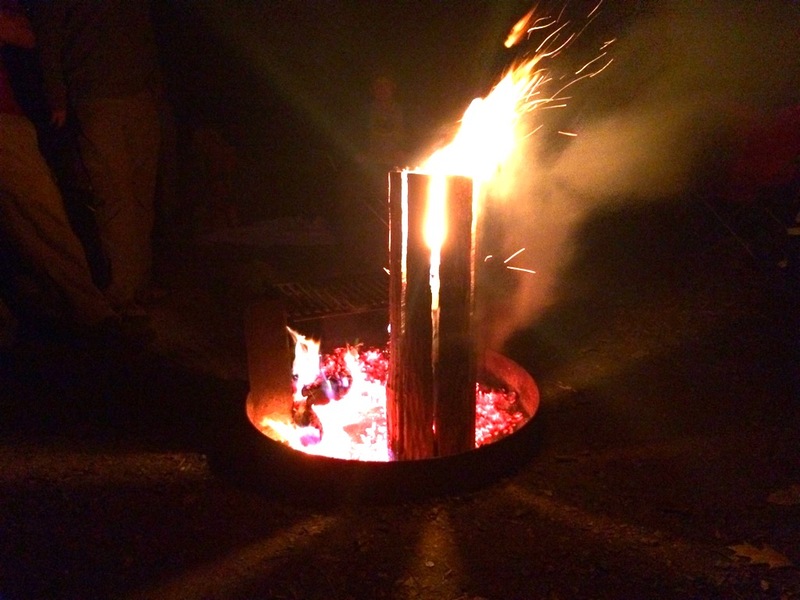 One of our rituals is torching a “cowboy candle.” A log about three feet long is chainsawed into eight standing and numbered sections. Everyone bets on the upright they think will be the last one standing. As we cheered for our cowboy candle favorites, the breeze sharpened in a way that signaled that we were on the doorstep of a new season. From now on, the year will age quickly. For that reason, we have only one more monthly work trip left in our regular season. Sometimes there’s a November encore trip, but that’s nature’s call as much as anything else. It could have been the food, the friends or even the beer, but on Saturday night I snuggled into my trusty sleeping bag and was lost in dreamland before my head dented my inflatable pillow. The morning dawned crisp. I turned up the collar of my fleece as I shivered in line for coffee. Steve Dannenfeldt and his daughter Shelby were in our group. Steve oversees the trail atop Compton Peak where my section terminates. His trail leads to the columnar basalt formation about which I’ve previously written. Unfortunately people in three separate groups were stung by yellow jackets. Paperwork! I was delighted that our group didn’t find any. 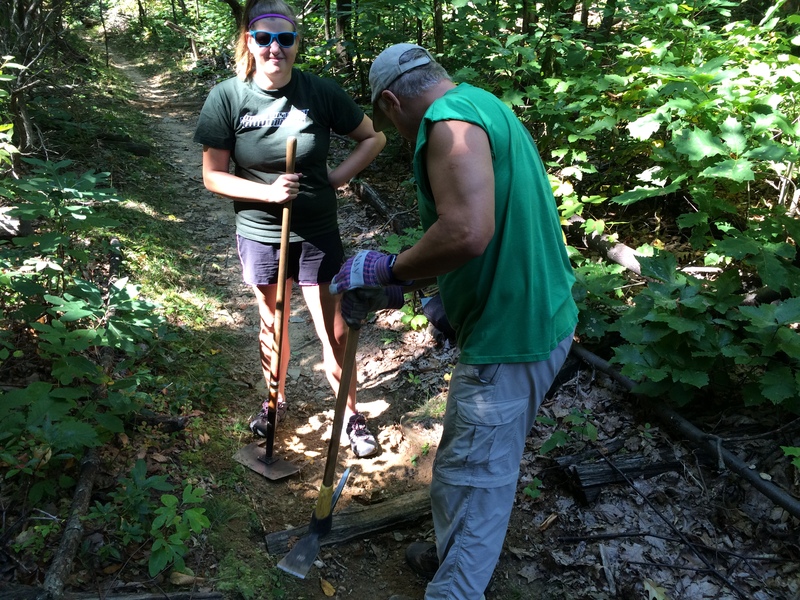 A trail workers work is never done……. Nope. Not ever. Our friend H20 ensures that we’ll always have a job. Nice shelter you had available. I like the idea of betting on the logs. After a couple of beers, that could get costly. I don’t know about you, but I find the early fall one of my favorite times. The skies are often a rich blue. The plants are big and showy. Trees are ready to put on a display of color. And the temps are right. The shorter days and longer nights are a reminder that winter is coming with a very different set of attractions. Thanks for showing another trail maintenance event. They are important. It was a well written piece. In the autumn air, humidity is reduced. Haze tends to disappear and the color and clarity of light changes. As a result, landscape photographs improve by becoming clearer, sharper with more color saturation. It’s like nature without deceptive makeup. We sweat plenty on Saturday, but nothing in comparison to those mid-summer crew weeks. Those were brutal. I’m all in for fall weather!